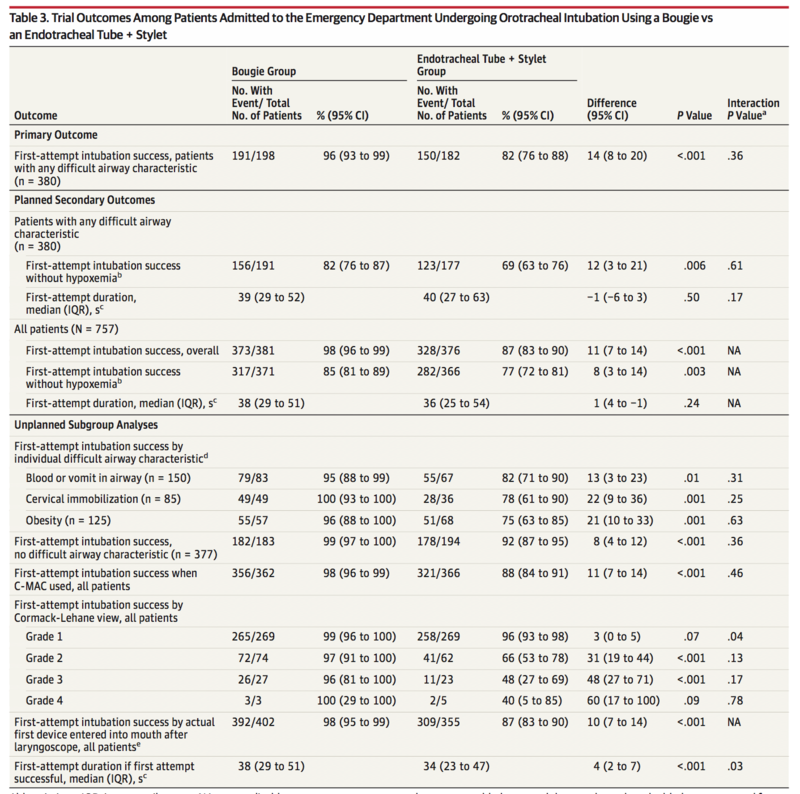 Effect of Use of a Bougie vs Endotracheal Tube and Stylet on First-Attempt Intubation success Among Patients with Difficult Airways Undergoing Emergency Intubation. JAMA May 2018. It’s been a year since Brian and his team published on the bougie and first past success in the ED (see link here) and now I got a chance to catch up with him on his newest publication. In this article, he’s validating the retrospective review they did with a true randomized, prospective study. His research portfolio is certainly becoming impressive with this game changer study. Check out the article review and interview below. This was a prospective randomization of use of bougie versus ETT and stylet in patients requiring emergent intubation in the ED. A randomized card was presented at time of intubation stating intubation was to be performed with a bougie as the initial attempt or ETT with stylet. All other airway interventions were at the discretion of the management team and the vast majority of intubations were with a CMAC. A total of 757 patients were randomized with 380 having a predefined difficult airway characteristic. No preload technique was used and video or direct laryngoscopy was left to the discretion of the intubator. Primary outcome was first pass success in patients with a difficult characteristic with secondary outcomes including hypoxemia, duration of intubation with further subgroup analysis below. This is the best study to date showing that the bougie, when used as the primary method of intubation, has better outcomes for first pass success and avoidance of hypoxemia. In further subgroup analysis, this was true in patients with difficult airway characteristics and those with routine intubations. The bougie also shined in Grade 2 and Grade 3 views, with blood or vomit in the airway, cervical immobilization and obesity. Furthermore, this study also shows that the reported disadvantage of a slower intubation when using the bougie was not seen and there was no statistical difference in complications when compared to ETT/stylet. What we’re seeing is a lot of good without any bad i.e. a game changer. The bougie has many advantages when compared to the ETT and stylet, including a smaller diameter and angled tip. This combined with the tracheal clicks or hold up sign make it a formable weapon in your airway arsenal. Prior studies have shown that the bougie is primarily used as a backup, but why not make it your go to? Unfortunately this is only one study at a single academic site. Additionally, the reported first pass success with the bougie is practically higher than any other documented in the literature; the most recent benchmark study put a pooled FPS at about 84%. Could there be some underlying bias or is the bougie really that good? Let’s chat with Brian Driver about some of the nuances of the study. Hey Brian, good to see you again. Congratulations on your new publication. We’re happy to see it out in print and excited to know people are finding it helpful. I was just checking the JAMA website and its already up to 30,000 views in all of four days. And so this is really the next level of the study that came out in 2017? Which was an observational study of the same concept. Exactly. First we just reviewed videos to make sure we weren’t crazy and that the bougie seemed to help with first pass success. We knew that wouldn’t be convincing enough to the world, which is why we did the randomized trial- to see if we could provide better data. So what does it take to get your department on board to randomize every intubation that’s occurring? Yeah that is a tall order. You know, emergency physicians are independent minded people. It’s a bit of a challenge. We’re lucky, my current chief, Jim Miner, he was the former research director and in the mid 2000’s he developed a research volunteer program. Now we have undergraduate volunteers that cover our ED 24 hours a day and they are the ones doing the enrollments and data collection. Totally, some poor undergrad has to tell an attending, “this is bougie, this is no bougie!” But a lot of it is emailing and talking at meetings: “you know we’re doing the bougie study, I know some of you aren’t happy about it, but it’s important.” And then we have the full support of the chief, Jim, so if someone would be habitually out of line, we could be like, cut it out. Of course, we gave the caveat that if some patient absolutely needs one device or the other, they could do that. We didn’t want any patients harmed. So you actually randomized all intubations but the primary end point was just in those with some quality for a difficult airway? And ultimately both groups had higher first pass success rates.. Right. The previous study demonstrated a difference of 95% to 86%. We weren’t quite sure how it would come out in a true randomized fashion so we chose to have that primary group with difficult airway characteristics just because we thought if the bougie was going to have a definite difference it would be in that group. What we assumed in the prior trial was that the bougie was preferentially being used in harder intubations and ETT in easier airways. By enrolling and randomizing, we had the bougie being used in easier airways and it had a first pass success of 98%, which is quite high. Randomizing allowed us to have a bigger gap than before because we using the bougie in airways that we might not of used it on before. That’s my impression anyway. Part of your discussion was that basically no other study has had such a high first pass success, now does this mean that if you’re going to be intubated, you should probably be intubated at Hennepin, or is there something else going on? I mean 98% is really high. Well I don’t think it’s all the bougie. It’s a very valuable adjunct. But I can’t say anyone who uses the bougie is going to get 98%. What I can say is that in the last few years, we’ve really been focusing on preoxygenation, which is going to give you a longer first attempt. From the paper you can see that we almost exclusively use the CMAC. So preoxygenation, video laryngoscopy and we also focus on proper positioning, so really it’s the complete package. So we can’t say it’s all bougie. I noticed no comment on preloading techniques. Was that discussed or used? Yeah that’s kind of just been the standard forever at Hennepin. Our respiratory therapists are well versed at putting the tube over the bougie. So we never have done that, I’m sure it would work great but just hasn’t been our standard. The argument is that it is faster, I presume? That always seems to be the discussion. The downside of the bougie is that it is supposed to be slower and preloading is supposed to speed things up. But of course, your study didn’t actually show a significant difference in time. Yeah so if you look at the Kaplan Meier figure, at first the ETT appears slightly faster, probably those easy airways where you can just quickly place the tube. But then at about the 30-35 second mark, the bougie starts to open up that gap and the bougie is able to get those where the tube is having a hard to pass, maybe under a grade 2 view or something. So for that grade 1 perfect view, it might be valid to say, I’m not going to use the bougie. But, my personal opinion is that there is value in performing a critical procedure the same way every time. So now that this study is done, are you guys using the bougie, every single time? Any plans to validate this study or make a multi-centered study? No firm plans but that’s a goal of ours. I really am curious about the generalizability of the study. In my mind, It should be generalizable because we basically just told the residents, stick the bougie in the hole. We didn’t say, hold the bougie 4 cm from the tip or other crazy things.” Bougie use is quite intuitive. People should be aware, however, that the tube can get caught at the arytenoids when passing over the bougie; if this occurs, withdraw the tube 2 cm, rotate 90 degrees counterclockwise, and readvance. Any last pearls for people first learning to use the bougie? I think one of the key advantages to using the bougie, which actually can maybe make you a little lazy with laryngoscopy, is that you don’t need that grade I view to pass the bougie. Certainly any grade 2 view where you can see the arytenoids is good enough for the bougie. I don’t make the residents struggle to get a grade I if they can’t get that view easily, I have them pass the bougie above the arytenoids. Of course you always want to get the best view possible, but as long as you can see arytenoids, you can pass the bougie. Then if there is a grade 3 view, then just slip it under the epiglottis. Awesome work, thanks for taking time to be interviewed!